Proprietary Name: Diphenhydramine Hydrochloride What is the Proprietary Name? Non-Proprietary Name: Diphenhydramine Hydrochloride What is the Non-Proprietary Name? 72485 - Armas Pharmaceuticals Inc.
Diphenhydramine Hydrochloride with NDC 72485-102 is a a human prescription drug product labeled by Armas Pharmaceuticals Inc.. The generic name of Diphenhydramine Hydrochloride is diphenhydramine hydrochloride. The product's dosage form is injection, solution and is administered via intramuscular; intravenous form. Labeler Name: Armas Pharmaceuticals Inc.
FDA Application Number: ANDA205723 What is the FDA Application Number? Diphenhydramine hydrochloride USP is an antihistamine drug having the chemical name 2-(Diphenylmethoxy)-N,N-dimethylethylamine hydrochloride. It occurs as a white, crystalline powder, is freely soluble in water and alcohol and has a molecular weight of 291.82. The molecular formula is C 17H 21NO • HCI. The structural formula is as follows:Diphenhydramine hydrochloride USP in the parenteral form is a sterile, pyrogen-free solution available in a concentration of 50 mg of diphenhydramine hydrochloride USP per mL. The solutions for parenteral use have been adjusted to a pH between 4 and 6.5 with either sodium hydroxide or hydrochloric acid. Diphenhydramine hydrochloride is an antihistamine with anticholinergic (drying) and sedative side effects. Antihistamines appear to compete with histamine for cell receptor sites on effector cells. Diphenhydramine hydrochloride in the injectable form has a rapid onset of action. Diphenhydramine hydrochloride is widely distributed throughout the body, including the CNS. A portion of the drug is excreted unchanged in the urine, while the rest is metabolized via the liver. Detailed information on the pharmacokinetics of Diphenhydramine Hydrochloride Injection is not available. For amelioration of allergic reactions to blood or plasma, in anaphylaxis as an adjunct to epinephrine and other standard measures after the acute symptoms have been controlled, and for other uncomplicated allergic conditions of the immediate type when oral therapy is impossible or contraindicated. For active treatment of motion sickness. For use in parkinsonism, when oral therapy is impossible or contraindicated, as follows: parkinsonism in the elderly who are unable to tolerate more potent agents; mild cases of parkinsonism in other age groups, and in other cases of parkinsonism in combination with centrally acting anticholinergic agents. This drug should not be used in neonates or premature infants. Because of the higher risk of antihistamines for infants generally, and for neonates and prematures in particular, antihistamine therapy is contraindicated in nursing mothers. Because of the risk of local necrosis, this drug should not be used as a local anesthetic. Hypersensitivity to diphenhydramine hydrochloride and other antihistamines of similar chemical structure. Antihistamines should be used with considerable caution in patients with narrow-angle glaucoma, stenosing peptic ulcer, pyloroduodenal obstruction, symptomatic prostatic hypertrophy, or bladder-neck obstruction.Local necrosis has been associated with the use of subcutaneous or intradermal use of intravenous diphenhydramine hydrochloride injection. In pediatric patients, especially, antihistamines in overdosage may cause hallucinations, convulsions, or death. As in adults, antihistamines may diminish mental alertness in pediatric patients. In the young pediatric patient, particularly, they may produce excitation. Antihistamines are more likely to cause dizziness, sedation, and hypotension in elderly patients. Diphenhydramine hydrochloride has an atropine-like action and, therefore, should be used with caution in patients with a history of bronchial asthma, increased intraocular pressure, hyperthyroidism, cardiovascular disease or hypertension. Use with caution in patients with lower respiratory disease including asthma. Patients taking diphenhydramine hydrochloride should be advised that this drug may cause drowsiness and has an additive effect with alcohol. Patients should be warned about engaging in activities requiring mental alertness such as driving a car or operating appliances, machinery, etc. Diphenhydramine hydrochloride has additive effects with alcohol and other CNS depressants (hypnotics, sedatives, tranquilizers, etc). MAO inhibitors prolong and intensify the anticholinergic (drying) effects of antihistamines. Pregnancy Category B. Reproduction studies have been performed in rats and rabbits at doses up to 5 times the human dose and have revealed no evidence of impaired fertility or harm to the fetus due to diphenhydramine hydrochloride. There are, however, no adequate and well-controlled studies in pregnant women. Because animal reproduction studies are not always predictive of human response, this drug should be used during pregnancy only if clearly needed. Diphenhydramine hydrochloride should not be used in neonates and premature infants (see CONTRAINDICATIONS). Diphenhydramine hydrochloride injection may diminish mental alertness, or, in the young pediatric patient, cause excitation. Overdosage may cause hallucinations, convulsions, or death (see WARNINGS and OVERDOSAGE). See also DOSAGE AND ADMINISTRATION section. The most frequent adverse reactions are underscored.1. General: Urticaria, drug rash, anaphylactic shock, photosensitivity, excessive perspiration, chills, dryness of mouth, nose, and throat. 2. Cardiovascular System: Hypotension, headache, palpitations, tachycardia, extrasystoles. 3. Hematologic System: Hemolytic anemia, thrombocytopenia, agranulocytosis. 4. Nervous System: Sedation, sleepiness, dizziness, disturbed coordination, fatigue, confusion, restlessness, excitation, nervousness, tremor, irritability, insomnia, euphoria, paresthesia, blurred vision, diplopia, vertigo, tinnitus, acute labyrinthitis, neuritis, convulsions. 5. GI System: Epigastric distress, anorexia, nausea, vomiting, diarrhea, constipation. 6. GU System: Urinary frequency, difficult urination, urinary retention, early menses. 7. Respiratory System: Thickening of bronchial secretions, tightness of chest or throat and wheezing, nasal stuffiness. Antihistamine overdosage reactions may vary from central nervous system depression to stimulation. Stimulation is particularly likely in pediatric patients. Atropine-like signs and symptoms; dry mouth; fixed, dilated pupils; flushing; and gastrointestinal symptoms may also occur. Stimulants should not be used. Vasopressors may be used to treat hypotension. THIS PRODUCT IS FOR INTRAVENOUS OR INTRAMUSCULAR ADMINISTRATION ONLY. 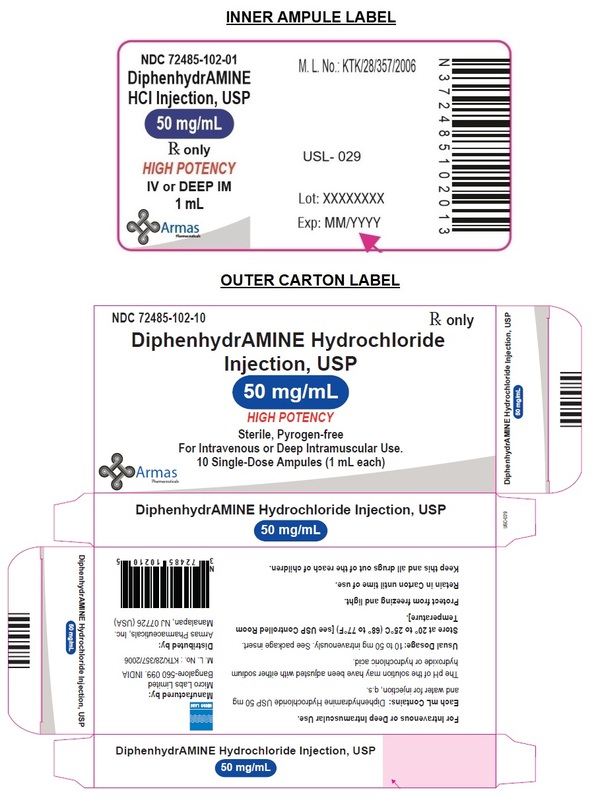 Diphenhydramine hydrochloride in the injectable form is indicated when the oral form is impractical. Parenteral drug products should be inspected visually for particulate matter and discoloration prior to administration, whenever solution and container permit. DOSAGE SHOULD BE INDIVIDUALIZED ACCORDING TO THE NEEDS AND THE RESPONSE OF THE PATIENT. 5 mg/kg/24 hr or 150 mg/m 2/24 hr. Maximum daily dosage is 300 mg. Divide into four doses, administered intravenously at a rate generally not exceeding 25 mg/min, or deep intramuscularly. 10 to 50 mg intravenously at a rate generally not exceeding 25 mg/min, or deep intramuscularly, 100 mg if required; maximum daily dosage is 400 mg.